I was absolutely thrilled yesterday to hear that I had won both first and third prizes in the third quarter Flash500 competition! I didn’t believe it for a while and then, when I saw the money in my PayPal account, I had a good old blub. An odd reaction, maybe, but I was completely overwhelmed as there are hundreds of entries every time. If you fancy reading the stories, don’t read the judge’s comments first as they contain spoilers. This news has come at the optimum time, as I had decided to stop writing flash for a while because I have had an idea for a novel that won’t go away however much I chase it. That’s not to say I’ll end up writing or finishing it, but I think I have to give it a chance, and I find the mindsets of very short and longer fiction impossible to switch between. If anyone has any good tips, I’d be very glad to hear them. I have done well with flash over the last three years, having won Flash500 twice, taken two third and two fourth places, and been honorably mentioned in a few other competitions, and I think I am now pretty competent at both knowing when I have a suitable idea and writing it down. One of the things I enjoy most about flash is the editing that takes place even before the words hit the page, and this is one of the main reasons I am going to find a novel challenging. Already I am editing the first scene in my head and I haven’t even opened a new document yet! The other thing that daunts me is the planning. I have the attention span of a puppy and it looks like far too much hard work at this stage. Did I mention how lazy I am? I’m not sure quite how to overcome this but I have to give it a go. Again, any tips will be most gratefully received. It’s eight years since I wrote my one and only novel and I daren’t even look at it because of the work I know it needs. Lazy, lazy, lazy. Anyway, wish me luck. I’ll let you know how it goes. Other news – my 1,000-word murder/mystery story, The Perfect Place, came third in Yorkshire Ridings Magazine’s competition. A mini-flash, Post Mortem, will be published in the Worcestershire Literary Festival’s flash anthology, The Seventh Christmas will be published at the end of the month by Alfie Dog, and the first stage of filming of The Beast Next Door is now complete and apparently went very well. I can’t wait to see the finished piece. I’ll be reading the flash (along with many other writers) at the anthology launch on December 9th, if anyone is around and fancies coming. And that’s about it for the moment. Cheers! 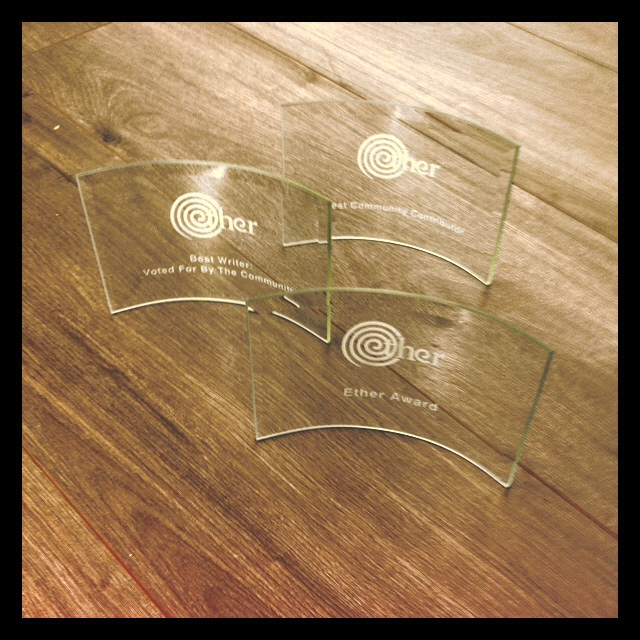 I’d just like to thank…. On Thursday night I received an award at the first Ether Books Awards! Unfortunately I wasn’t able to get to the London ceremony, but it sounds as though it was a great evening with headaches the next day to prove it. I am delighted that The Beast Next Door has proved so popular with the e-reading public and hope it encourages readers to download some of my other stories via the free Ether App. Reality TV has also been in the top five paid downloads over the last few weeks, so please pop along and have a read. Other news. I finally received a copy of Yorkshire Ridings Magazine in which my thousand-word murder/mystery story has been published. Unusually for me, I didn’t read the story wishing I could change at least one word in every sentence, so I have to report that I am pleased with it, especially not having written in that genre before. You can read the story here. Disregard the stray inverted comma at the beginning – it isn’t in my original document. My other story that features The Strid is still getting around 70 visits a week because of the article a few months ago on Cracked.com about places most likely to murder you. It’s a fascinating article and The Strid came in third, so I feel justified in being haunted by it all my life. The film of The Beast Next Door has now been cast and will go into production in the autumn, so that’s exciting too. All this and Andy Murray in the Wimbledon Final as well! My cup overfloweth. But now I must find a space in my trophy cabinet for my lovely Ether Award and instruct the downstairs maid to lick it clean every morning. Good luck for tomorrow, Andy! I’ll be watching from behind the sofa. 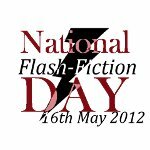 National Flash Fiction Day is over for this year, excepting the odd competition that is tied in with a literary festival. I have come away from it with two great new experiences: reading a story aloud to an audience for the first time at the Eight Cuts Flash Slam event in Oxford yesterday evening, and being one of the selecting editors for FlashFlood. First the live reading. I gaily signed months ago to read my Flash500 winner, Mother’s Pride, thinking it was so far in the future that it would never happen. Then a few weeks ago I realised it was nearly May 16th, had serious misgivings, and almost pulled out. However, urged on by sadists, I decided to make myself do it, even if it meant getting drunk and wearing Huggies. And it went really well! The audience, at the Albion Beatnik Bookshop, couldn’t have been friendlier, and a glass of wine helped steady my nerves. The words were therefore rather blurred and kept disappearing off the page, but I knew it by heart and managed not to fluff anything. I was one of fourteen readers, all of whom, including the wonderful Tania Hershman, performed excellent stories to a very high standard. Tania read three of her own flashes and one of Richard Brautigan’s, proving that flash is far from being a new idea. Today I found out that I was the only one who hadn’t performed live before, and I’m bloody glad I didn’t know that before! So, now that I’ve cut my teeth, I wouldn’t mind doing it again. And I’d urge anyone who fancies the idea to give it a go. It’s worth it for the sense of achievement (and relief) when it’s over! Secondly, the FlashFlood selection. It was my stint on Monday and I reckon people had been busy over the weekend polishing their stories, because it was non-stop from 9am until 11pm with a fifteen minute break for lunch. I read over fifty stories, most of them two or three times, and the standard of writing was generally very high. There were some real gems and several that made me wish I’d written them, and I was delighted to be in the position of choosing them! However, by the end of the day, I was actually quite depressed, the reason being that the subject matter of most of the entries was unrelentingly miserable! Having kept a close eye on judge’s reports for flash fiction competitions (looking for clues) I have heard this said many times. If something quirky, darkly humorous or funny turns up, the judge leaps on it with glee and, unless it’s badly written, it is almost bound to make the shortlist. Don’t get me wrong – tragedy, if written well, can be the most affecting of all genres and I take my hat off to those who can pull it off. I love to try and write it myself – death is of perennial interest. But my advice is, if you’re going to write about death, divorce or dementia, really go for it. Push it as far as you can and, if you can add some comedy into the mix, do so! A subtly placed lighter moment can throw tragic events into greater relief and wry humour may leave the reader with a much stronger impression of events. In short, flash fiction is an opportunity for experimentation with format, subject and voice. I know when I have found a strong or idiosyncratic voice, or pushed a theme to an unexpected place, those stories have done well. Grab the judge by the throat – make them laugh, make them cry – but don’t just leave them feeling a bit miserable, because they won’t want to read it a second time. In my opinion, of course! The story I submitted to FlashFlood, which had to run the gauntlet of editors like everyone else’s, is here. I hope you enjoy it. Thanks to Dan Holloway for arranging the Flash Slam and especially to Calum Kerr, Mr Flash Fiction himself, without whom none of these great events would have taken place. A quick round-up of my current status regarding the various competitions I have entered for National Flash Fiction Day, next Wednesday, May 16th. One of my stories was longlisted in the Spilling Ink comp but got no further. Both my entries in Flash500 were shortlisted and one came in fourth, Highly Commended, and received a judge’s comment and a prize. There were several hundred entries, so I’m delighted. Having now been placed 1st, 3rd and 4th (twice) I am hoping to take that elusive 2nd one day! I really recommend reading the top three stories – all are excellent and worthy winners – as are the winners of the Humour Verse competition. They are laugh-out-loud funny. All my other entries have yet to be judged. I also heard last week that my competition entry for a 1,000 word murder/mystery in Yorkshire Ridings Magazine is to be published in their next issue. So that’s exciting, especially as I’ve never written murder/mystery before and hadn’t really a clue how to start. I am one of the editors for Calum Kerr’s project ‘FlashFlood‘, which isn’t so much a competition as a selection process. The best entries will be published on the website on May 16th at regular intervals – possibly as often as every five minutes judging by the flood of entries – and will be left there for the immediate future to give everyone a chance to read them all. So please, get your 500-word flashes in by the end of the 15th May – further details on the site. And that’s it for now because I have another competition to enter, deadline tomorrow!